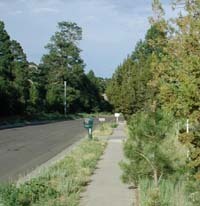 Overgrown shrubs and trees are significant problems on residential streets. They should be trimmed back by property owners. 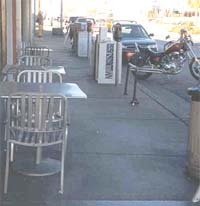 Urban streets are encroached and narrowed in a variety of ways. Often, as in this picture, what's good for some people (patrons of the sidewalk café) is bad for others (those who are trying to walk on the sidewalk). The best solution is to design sidewalks with enough clearance so that all users can be accommodated. 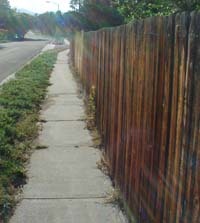 In the photo at right, the fence is an obstruction that prevents a pedestrian from walking as close to the right side of the sidewalk as he or she might prefer. Where fences, buildings, etc. 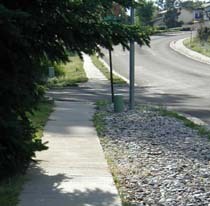 may be right next to the sidewalk, it should be designed with additional horizontal clearance or "shy distance".